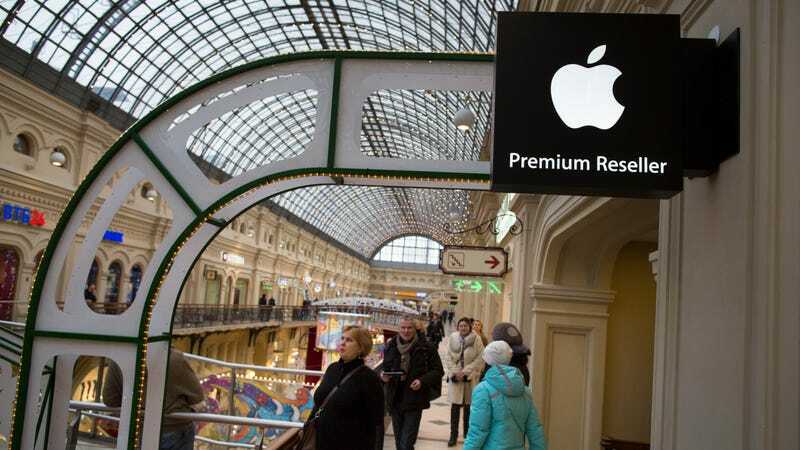 An Apple premium reseller location at the Moscow GUM State Department store, 2014. So, by removing these two features from Kaspersky Safe Kids for iOS, we are massively letting down parents, who expect that their kids will be able to safely use iPhones and iPads that have our app installed. ... We have repeatedly tried to contact Apple to resolve this situation, but no meaningful negotiations have ensued. The company further alleged that Apple had ordered the removal of the features from the Kapersky Safe Kids app because it had introduced its own Screen Time functionality in iOS 12. Apple thus “appears to be using its position as platform owner and supervisor of the sole channel for delivering apps to users of the platform to dictate terms and prevent other developers from operating on equal terms with it,” Kapersky argued. As TechCrunch noted in December 2018, Apple does appear to have cracked down on third-party screen time and parental control trackers in general after it launched iOS 12. According to ZDNet, Kapersky filed the antitrust complaint solely with the Federal Antimonopoly Service of Russia, and not with their equivalents in the European Union. However, last week streaming music service Spotify filed an antitrust complaint with the European Commission, the EU’s executive arm. Spotify argued that Apple’s control over which apps are available through the App Store—and what is allowed to happen in those apps—at the same time it operates its own competing services gives it an “unfair advantage at every turn.” In turn, Apple issued a response that dodged the core question of whether its practice of taking a 30 percent cut of third-party app revenue unfairly benefits its own services, like Apple Music. As ZDNet noted, Kapersky filed other antitrust complaints against Microsoft in Russia and the EU in 2016, claiming an update to Windows 10 made it hard for third-party antivirus services to compete, though dropped those claims after Microsoft revised their policies. The cybersecurity company has had a rough few years. In 2017, the U.S. federal government imposed a ban on Kapersky products by federal agencies after reports that Russian intelligence agencies were using its software to gain access to protected systems (including at the National Security Agency). In early 2018, it was booted from Twitter over those allegations, with Kapersky later moving some of its infrastructure to Switzerland to win back trust. The claims were always somewhat unusual, as Kapersky Labs is well-respected in the cybersecurity community. It strongly denied the allegations, and reports in 2019 indicated it was actually Kapersky staff who flagged a former NSA contractor accused of stealing terabytes of data from the feds.